Medium Weight – 4 Cycle Stomper Rental – Stone XH730, available for rent from the Duke Company in Rochester NY, Ithaca NY and the entire Western New York region. Also known as a plate compactor and rammer. 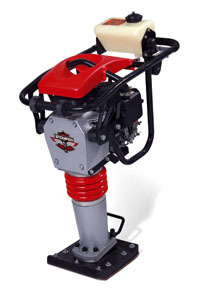 Middle weight 4-cycle Rammer / Stomper® – impact with an manageable weight for a great all-purpose rammer. Smooth running & easty to operate. 4-cycle 3 hp Honda engine design for rammer applications. Quality components including a two-stage air filtration system, forged pistons and solid snubbers, these Stompers are built to last.